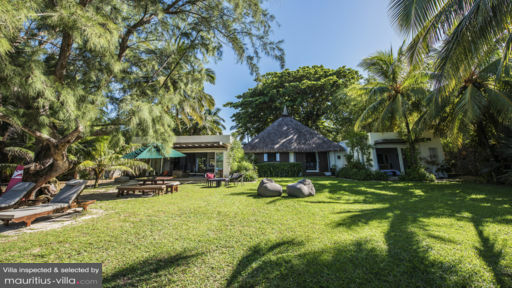 Nestled on one of Mauritius’ most scenic coasts, Villa Cotiere offers an assortment of services that will help you enjoy a fully relaxing holiday under the sun. Thanks to its proximity to the beach, you will be able to enjoy a dip in the lagoon whenever the mood strikes. Best of all, the villa comes with an assortment of features and facilities to keep you entertained whenever you don’t feel like going out. With expansive living and sleeping areas spreading across 300 square meters, this villa can very easily accommodate larger families or groups of friends and colleagues. Villa Cotiere has four bedrooms that can sleep up to eight guests. Three of the bedrooms have Queen-sized beds, while the fourth one has two single beds. All bedrooms have air-conditioners, ensuring a good night’s rest so you can wake up refreshed and ready for another day of adventures in Mauritius. While Villa Cotiere does not have a swimming pool, rest assured that you can enjoy a refreshing dip whenever you want thanks to the shimmery turquoise lagoon which lies only steps away from the villa. After your swim, spread a towel on the silky soft sand and dry off as you work on your tan. Rest assured that there’s plenty of space to tan right in the privacy of your garden as well. Grab an ice-cold drink, put on your shades and relax on the comfortable lounge chairs that face the ocean, or curl up with a good book by the shade of swaying coconut trees. When the weather is good- which is almost every day in Mauritius, take your meal over to the outdoor dining table on the terrace and enjoy scenic views as you tuck into your food, serenaded by the soft chirps of tropical birds. Nestled in a whitewashed stone room, the living space of Villa Cotiere is brimming with warmth and homeliness. The dining room is also enclosed within a stone alcove that boasts a rustic-style dining table with plenty of shabby-chic charm. If you don’t want to eat out, you can always make full use of the perfectly-appointed kitchen to whip up a quick dinner. In fact, the kitchen comes with an assortment of utensils and appliances which you can use. After dinner, head over to the media room where you and your family can gather around the flat-screen television. 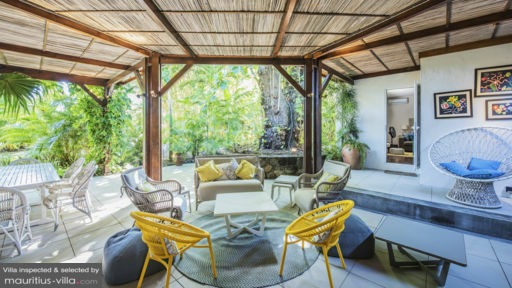 With a stay at Villa Cotiere, enjoy services such as complimentary housekeeping which leaves you with more time to make the most of your holiday in Mauritius. With free WiFi, this villa provides a designated barbecue area as well. Upon request and for an extra fee, you can also book additional services such as airport transfers and the lies. 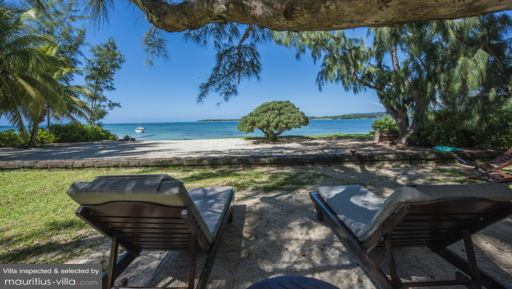 Only 38km from the island’s only airport- Sir Seewoosagur Ramgoolam Airport- Villa Cotiere lies a short stroll from the public beach of Trou D’Eau Douce which boasts scenic picnic areas. This beach is lined by food trucks specializing in local delicacies which you can savor as you gaze out at the seemingly infinite horizon. You can also book a glass-bottom boat ride to explore the magnificent corals and shoals of fish that lie near the reefs.